I think possibly this could be the best picnic so far this year, and I had quite a few last week on the Isle of Harris! It is Sunday the 2nd of April. Lambing hasn’t started yet. The sun is shining and we have friends staying so some time off is definitely in order. We all, young and old(er), head down to the stony beach below the house. Because it has been raining we take some kindling sticks with us rather than picking up dry (dead) twigs from the woodland. 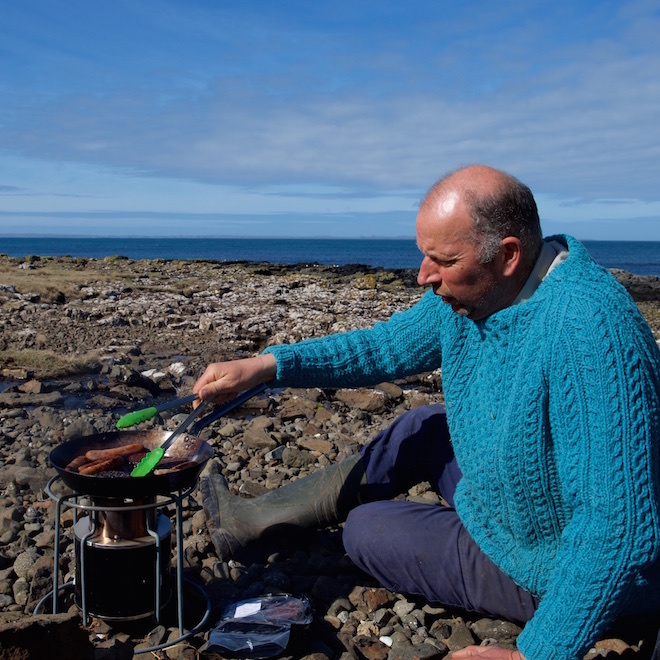 We want to try out the Ezy Stove that Farmer was given for Christmas. This is an energy efficient design, which is hoped will save forest timber and collecting and carrying time in India and Africa where traditionally cooking has been done with labour intensive fuel wood. 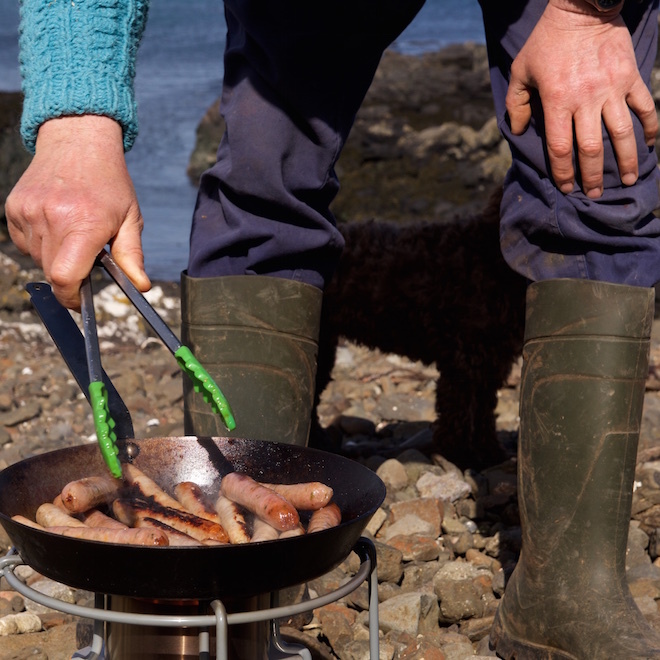 Our verdict is that it is a really good stove. We have a heavy duty frying pan and so didn’t need charcoal to heat up sufficiently or make a huge log fire, it literally only took a few sticks and some dry bracken to get it going. To cook – we have shopped locally! We have both gluten free and cheese and onion Island Pork sausages (from Mull Cheese). I bought home some black pudding from Stornoway but normally we would have Mull made black pudding too! 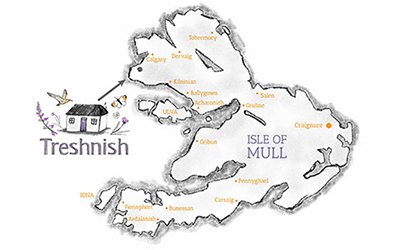 This is pure bias – but I love the view below the Treshnish Cottages! It seems like the best view to me. Straight out to sea and the Isle of Coll on the horizon. No need to get in the car and drive. It is a 10 or 15 minutes walk from the cottages depending in how much you dawdle on the way! Afterwards we walk across the rocks as the tide is out, and look for frog and toad spawn in the rock pools. It never fails to amaze us that year after year we find so much frog spawn in these brackish pools. 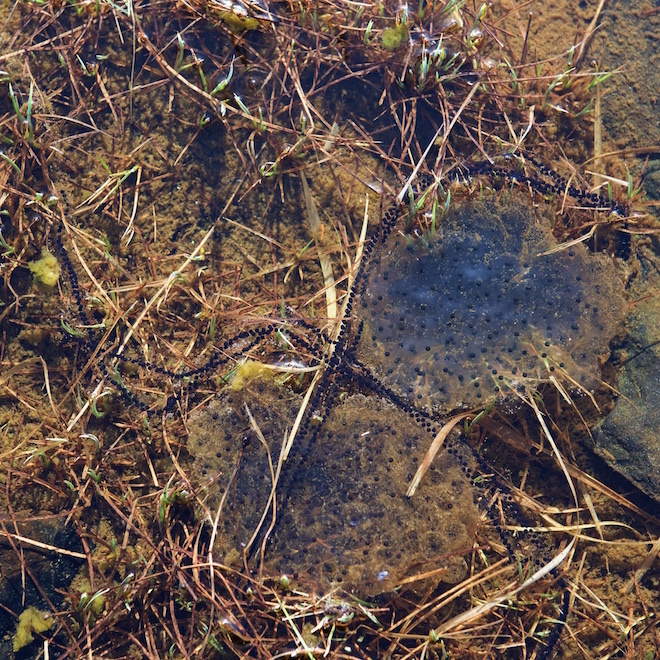 In some pools the tadpoles were just beginning to emerge – they were tiny! Occasional primroses flowering in sheltered places, and lots of sunshine celandines peppering the grass. Spring is hopefully on its way!